THE CERAMICS INDUSTRY IS RIDING HIGH ONCE AGAIN, FIRING HOPES OF AN UPTURN IN THE CITY KNOWN AS THE POTTERIES. 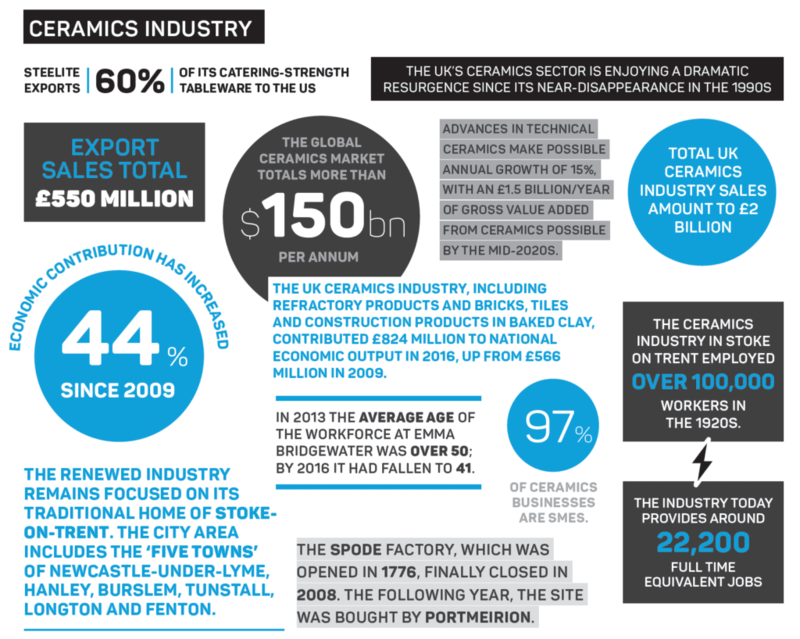 The UK ceramics industry was a powerhouse of the Industrial Revolution. At its peak, Stoke-on-Trent was the epicentre of the world’s pottery production and home to more than 2,000 kilns, firing millions of products a year. The industry slumped spectacularly in the global recession of the late 1990s and, as major names fell by the wayside, Stoke-on-Trent’s economy fell on hard times but it’s now staging a strong fightback; confidence among business leaders in the Potteries is buoyant once again. TraditionaI pottery production is on the up and this confidence is being bolstered with a strong craft pottery sector and an emphasis on futureproofing the industry, through the new Ceramic Sector deal and plans for an international advanced ceramics centre in Stoke-on-Trent. Many of the sector’s major names have reported robust trading figures and strong ongoing financial forecasts. Portmeirion, which employs around 600 people at its Stoke-on-Trent headquarters, is on track for another record year after seeing revenue climb by more than 11 per cent in the last six months, recording revenues of £36.9 million for the half-year to June 30 – up from £33.1 million for the same period in 2017. The firm’s pre-tax profit is also up – by 29.1 per cent – from £1.6 million last year to £2.1 million. A similar picture is evident at Churchill China. Revenue was up by six per cent to £27.2 million in the first six months of 2018, from £25.8 million in the same period in 2017. 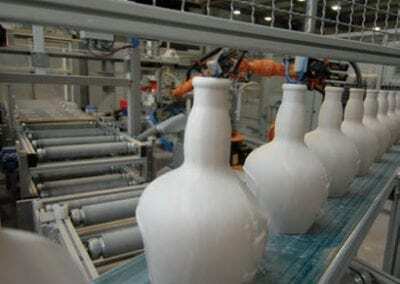 Export sales rose by 16 per cent in the same period. Churchill has announced plans to launch several new ranges and invest in equipment and staff at its Stoke-onTrent headquarters, to manufacture more products, increase kiln capacity and improve the flexibility of its operations. 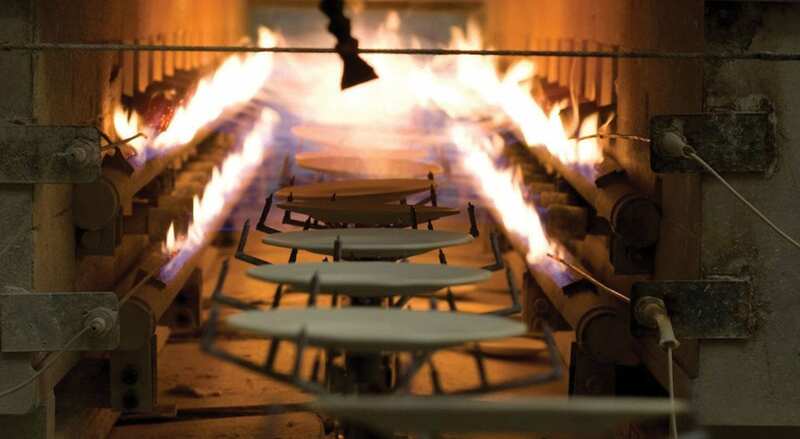 Meanwhile, Dudson, which has been manufacturing since 1800 and is one of the city’s oldest pottery companies, has big ambitions to double in size over the next five years. The company, which is still family-run, has also announced a partnership with North America’s leading tabletop supplier, Arc Cardinal. Wade Ceramics recently opened a second Stoke-on-Trent site and now employs 315 staff. Production has increased by 25 per cent over the past year and is expected to increase by a further 10 per cent in 2019. Turnover was £10 million in 2017, stands at £13 million in 2018 and is forecast to rise to £14.5 million in 2019. Wade Ceramics recently opened a second site in Stoke-on-Trent. Investment in advanced technologies and meeting the demand for presentation packaging has been a feature of the Potteries Renaissance. The history of Wade mirrors the major changes the pottery industry has gone through in its Stoke-on-Trent heartland. The current business is vastly different to the pottery manufacturer of the past. Paul Farmer oversaw a move to a modern, advanced factory in 2010, which safeguarded 146 jobs. 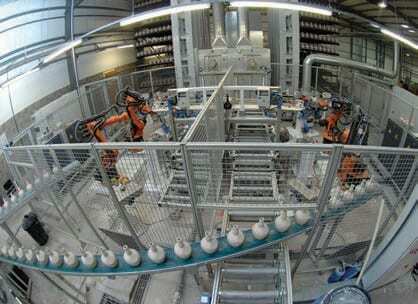 The new plant is well known for using the latest robotic technology in the production of ceramic flagons for the drinks industry. Investment since 2010 has totalled around £14 million, and this has driven jobs and growth. The demand for ceramic presentation bottles for drinks, such as whisky, gin and vodka, continues to rise and a further upturn for ceramic lamps, fragrance bottles and table items, such as the top selling Wade Glugglejug, has spurred further growth. Farmer is also President of the Staffordshire Chambers of Commerce, which gives him an overview of the business temperature in his home city. “The ceramics industry is working well together to future proof the industry. We have the Ceramic Sector Deal in place, which is a very positive move,” he said. “It includes the fully-funded Ceramics Challenge, which aims to solve the skills gap by targeting school children, and to bring the best young talent into the industry. Mr Farmer’s optimism is fuelled by new developments such as the Ceramic Sector Deal and plans to build a world centre of advanced ceramics. The Ceramic Park plan, led by materials technology company Lucideon, is predicted to create 200 jobs and will cater for both traditional and advanced ceramics. “Lucideon is committed to the growth of the traditional and advanced ceramics sectors by providing its materials expertise, facilities and pioneering spirit to expedite the journey from research and development to commercial products and processes,” said Chief Executive Tony Kinsella. His company has joined with local partners to propose that a world-leading Ceramic Park is based in Stoke-on-Trent. With unrivalled research, pilot plants and commercialisation services, coupled with education and training to develop a new generation of commercially-minded scientists and engineers, the Ceramic Park will become the driver of economic growth and attract national and international investment into the city. “Relocating our business to the Park will allow us to double our workforce, and to develop and support the hoped-for NASC (National Advanced Sintering Centre,” he explained. When it is delivered, NASC will deliver a step change in the development and production of ceramic products that cannot be made by conventional methods. The British Ceramic Confederation reports that the worldwide market for ceramics was US$158 billion in 2014. It is expected to reach $286billion by 2022, with the highest growth expected in technical ceramics. BCC Chief Executive Dr Laura Cohen said: “The global ceramic industry is growing and, in the UK, we are seeing evidence of this in all areas of our membership, from brick makers and refractories to wall tiles and tableware. This is one of the most important times for our sector. UK ceramic researchers and manufacturers are leading the way with revolutionary breakthrough technologies and products like aircraft components.” Dr Cohen describes the current resurgence as a renaissance but emphasises that the opportunity is there to grow further in the future. “Ceramic materials outperform metals, plastics and others in challenging conditions, such as extreme changes in temperature, pressure and so on, and this means they are used as components in brake discs, fuel injection systems, thermal barrier coatings in engines and heat protection systems in spaces shuttles,” she added. 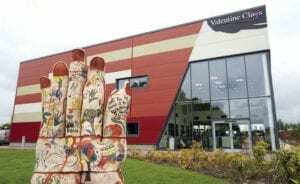 Clay producer Valentine has created a new exhibition centre at its £3m state-ofthe-art headquarters. The new complex, opened in 2017 in Fenton, Stoke-onTrent, houses one of the best exhibitions of contemporary ceramics in the UK. 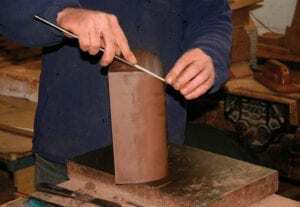 It hosts the popular “LoveClay” workshops, where people can learn to throw a pot amongst other ceramic disciplines, often with the support of well-known pottery designers, such as Keith Brymer Jones. Hannah Ault, Valentine Clay’s Sales and Marketing Director, says that LoveClay was born as a reflection of a new-found optimism in the ceramics industry. “Ceramics are very on trend at the moment and the craft sector is strong. People love clay and want to see interesting and unique ceramic design. Pottery production has become much more interesting in the last few years, with customers moving away from whiteware and demanding a design-led product.” Valentine Clays produces clay for companies across the world, including specialist product for many craft potters. Valentine Clays’ new HQ champions the ceramics industry, with LoveClay workshops and events such as Nic Marsh and Philip Hardaker’s exhibition. Valentine Clays has plans to develop a café and a woodland ceramic sculpture trail within its extensive grounds and has ambitions to see its site becoming a major regional tourist attraction. The core clay manufacturing business is also thriving, with the company’s 14 production lines working to maximum capacity. Pottery manufacturers received a boost from the 2018 Royal Wedding of Prince Harry and Meghan Markle. Manufacturers making royal commemorative ware include: Royal Crown Derby, Moorcroft, Dunoon and Emma Bridgewater. A review of current EU rules on anti-dumping legislation has provided extended stability for the ceramic industry. The European Commission review means current rules will stay in place until May 2019 across Europe and the UK. British Ceramic Confederation (BCC) Chief Executive, Laura Cohen, said: “Since the EU introduced antidumping duties on unfairly cheap imports from China, our UK ceramic industry has been able to stabilise and grow.” The BCC called for the UK Government to continue to ensure UK ceramic manufacturers have a level playing field after Brexit. An MP has proposed mandatory country of origin stamps to protect UK ceramics. Ruth Smeeth, Labour MP for Stoke-on-Trent North, told the House of Commons a ‘Made in England’ stamp would be a “guarantee of craftsmanship”. A pottery firm from Yorkshire has gone viral after one of its potters made a Brexit-themed mug – complete with holes in its sides. Lee Cartledge of Bentham Pottery, Ingleton, created the mug featuring the word “Brexit” in lettering which sabotages its ability to carry liquid. Steelite International opened a new 50,000-square foot warehouse in 2018 to cope with high demand. Steelite currently produces more than 500,000 pieces of tableware every week but said new space was necessary to free up capacity for further manufacturing output at its Middleport, Stoke-on-Trent factory. A Stoke-on-Trent pottery has been named in the top 10 industry, trade and commerce places which help tell a history of England. Middleport Pottery received hundreds of public nominations, according to the Director of the V&A, Tristram Hunt.